Pott Industries delivered the vessel in December 1983. The Title XI approval covers $4,110,000, or 75 percent of the actual cost of $5,577,017. Organized in New Orleans more than 13 years ago, RFI specializes in consolidating less than full barge- load consignments of regulated commodities, particularly steel, for shipment north from New Orleans on the inland river system. Mr. Wilkins is returning to the lat- ter organization in his present posi- tion, having previously served as customer service representative and assistant manager during earlier service with RFI. breakstrength of steel and 1/20 the weight in water! KEVLAR aramid means lighter marine systems...less costly, easier to handle. Now you can get the strength you need in large marine ropes for offshore oil rigs and other maritime applications-at only 1/5 the weight of steel in air and 1/20 the weight in water. DuPont KEVLAR aramid fiber permit use of smaller, lighter buoys (photo at right) and allow faster anchor deployment and retrieval. Significant systems cost reductions can be realized. In riser tensioner applica- tions, ropes of KEVLAR last up to 4 times longer in actual field use, due to their superior cyclic fatigue properties. Ease of handling provides important savings in in- stallation time and labor. 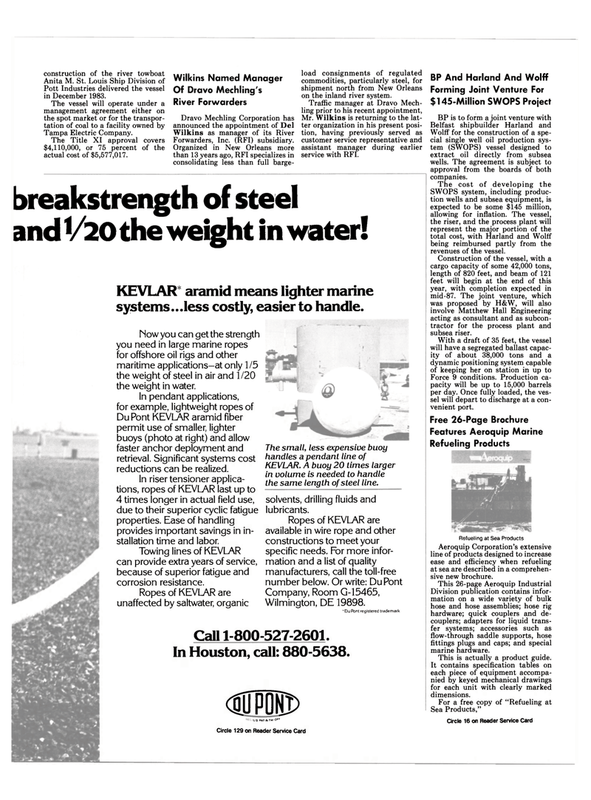 Towing lines of KEVLAR can provide extra years of service, because of superior fatigue and corrosion resistance. Ropes of KEVLAR are unaffected by saltwater, organic solvents, drilling fluids and lubricants. KEVLAR. A buoy 20 times larger in volume is needed to handle the same length of steel line. Wolff for the construction of a spe- cial single well oil production sys- tem (SWOPS) vessel designed to extract oil directly from subsea wells. The agreement is subject to approval from the boards of both companies. SWOPS system, including produc- tion wells and subsea equipment, is expected to be some $145 million, allowing for inflation. The vessel, the riser, and the process plant will represent the major portion of the total cost, with Harland and Wolff being reimbursed partly from the revenues of the vessel. Construction of the vessel, with a cargo capacity of some 42,000 tons, length of 820 feet, and beam of 121 feet will begin at the end of this year, with completion expected in mid-87. The joint venture, which was proposed by H&W, will also involve Matthew Hall Engineering acting as consultant and as subcon- tractor for the process plant and subsea riser. Force 9 conditions. Production ca- pacity will be up to 15,000 barrels per day. Once fully loaded, the ves- sel will depart to discharge at a con- venient port. Aeroquip Corporation's extensive line of products designed to increase ease and efficiency when refueling at sea are described in a comprehen- sive new brochure. Division publication contains infor- mation on a wide variety of bulk hose and hose assemblies; hose rig hardware; quick couplers and de- couplers; adapters for liquid trans- fer systems; accessories such as flow-through saddle supports, hose fittings plugs and caps; and special marine hardware. This is actually a product guide. It contains specification tables on each piece of equipment accompa- nied by keyed mechanical drawings for each unit with clearly marked dimensions.